One of the Seven Wonders of the Modern World, the CN Tower, is celebrating a few anniversaries today. 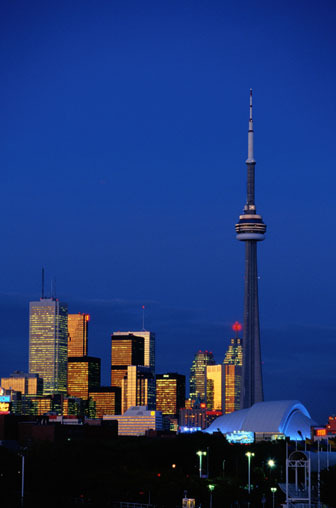 The CN Tower is the world’s tallest tower, at 1, 815 feet 5 inches. It cost approximately $63 million to build, and 40 months to complete. Today marks 3 separate anniversaries for the CN Tower: in 1976, the CN Tower was opened to the public; in 1994, the Tower celebrated the opening of the glass floor; and in 1998, the entertainment expansion was opened. The CN Tower has a variety of ways that tourists can enjoy the view including the Look Out level, the Glass Floor, the Sky Pod, and the latest attraction, the EdgeWalk. The library is the key to unlocking architectural resources. Click here to open a library Bookbag full of titles about architectural design, sustainable construction, and structural design. Or perhaps you’d prefer to watch a video from the Films on Demand database; click here to discover how the CN Tower was built. If you want a customized view, the library has that covered! Check out the Architecture Subject Guide – we’ve got all the educational building supplies you need! This entry was posted on Tuesday, June 26th, 2012 at 8:53 am and is filed under Cummings Library, Recommendations, Subject Guide, Uncategorized. You can follow any responses to this entry through the RSS 2.0 feed. Both comments and pings are currently closed.